Have you ever seen someone who looks like Ex-President Barrack Obama before? – Let Briefly Introduce to You, Jose Oliveira who take the exact looks of him. Mr. Jose Oliveira looks exactly like Ex-America President, Barrack Obama concur with the popular African’s proverb that says “God created all human being in twos”, and no one could doubt it by merely looking at them, they are the same un perspective height, the same skin color, the same facial look etc. Jose Oliveira, who is just 43 years old Is like a twins brother of Barrack Obama. Mr. Jose Oliveira is a native of Cape Verde, he works as a tour guide who cannot go a day without meeting different people from different places, while they will make sure they take a self in the streets with him. 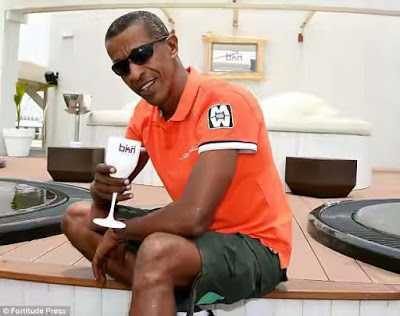 Mr. Jose Oliveira said his friends have nicknamed him as Mr. Barrack Obama and for sure, he has been mistaken as the real Barrack Obama for the past ten whooping years. He says he has not, even for once worked as an “Obama Look alike” but, it will be a great opportunity for him if such opportunity knock on his door at any time.